A good meeting yesterday with Diana Balmori and her colleague Monica. We talked about a couple of projects that we're pitching on together and about the work we'd done at Creative Concern on place branding and creating a sense of place by working with communities, specifically the Real Lives campaign in Wythenshawe. After that we talked on the related topic of the 'shrinking cities' concept that gets peddled around by planning academics (particularly a group led by Phillip Oswalt in Germany, who decided to label Manchester as one of their so-called Shrinking Cities). It strikes me that whilst, historically, cities may well have come and go, with the twin-tracks of intense urbanisation and resource depletion/climate change, we cannot entertain the idea of shrinkage - or even the death of cities - any more. We have to follow a course like Manchester's, and respond to industrial change through innovation and renewal... that's why the original modern city isn't shrinking any more. 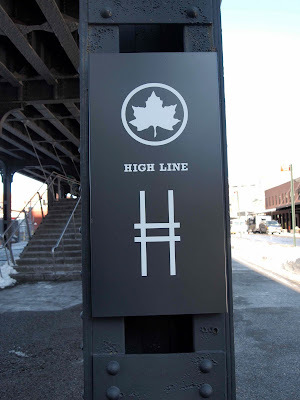 After our chat I wandered along the High Line. Bloody amazing and inspirational. Photos here. Had a fab time this morning speaking to a breakfast session at the Urban Design Institute in NYC. The session was held at the Center for Architecture and the other presenters were Jake Barton (Local Projects), Jorge Colombo (artist) and Katie Dixon (Downtown Brooklyn Partnership). With a good sized group of urbanists, architects and designers we discussed communication and urban design, and how the new accessibility of information is changing the way we experience our cities... we also had a good old poke at consumerism and bad branding... or at least I did. My fellow presenters were fascinating. Jorge's work for the New Yorker, painting with an iPhone, was beautiful and insightful; Jake's work with interactive installations was utterly brilliant and I totally plan to collaborate with his group if I can; and Kate's work in Brooklyn is so close to some of our work, it was brilliant to make a connection. Fab to be in the Center for Architecture, too - very much in the vein of our own, fabulous CUBE in Manchester. We've never had the easiest of relationships with How-Do, in all honesty, so it was with some trepidation that I agreed to do an interview with Tony Murray today, and gave him an opportunity to 'let rip' on subjects such as climate change or place branding that usually set the comment boards alight. Tony agreed that my replies wouldn't be edited, so I was happy to go ahead with it, and I hope the resulting interview will make it a bit clearer for How-Doers where we sit in the Pantheon of Northern Communicators. Tonight we officially launched Manchester's new climate change action plan with the help of Ed Miliband, shortly before he disappeared off to Copenhagen. Creative Concern worked with M Four and Manchester City Council on drafting the plan, editing the final text and we also built the plan's website. We're very proud of the plan but even more proud of our city for signing up to some bold targets including the headline target of a 42% cut in CO2 emissions before 2020. Bold stuff, and as we wrote in the plan, if the world's first and definitive industrial city can get to grips with climate change then no city, anywhere else in the world, has any excuse to leave this issue in the tray marked 'too difficult'. At the Bluecoat in Liverpool today, we helped with the launch of 'Adapting the Landscape', a framework vision for a new, productive landscape fusing together the two city regions of Liverpool and Manchester. As well as producing some materials and a presentation for the event, Creative Concern was a key part of the project team, contributing to the new vision for a land that is home to 6 million people and an economy of £50 billion. The other members of the project team - led by URS Corporation - were WXY Studio in New York, West 8, Barnes Walker and the lovely people at Urban Practitioners. The project was funded - and steered - by the NWDA and the Regional Parks Xchange (where you can go to download the presentations from the event) as well as the Mersey Basin Campaign, Natural England, Homes and Communities Agency and Peel Holdings. The ‘Adapting the Landscape’ research study is basically about using landscape, place and sustainability to help unlock even higher levels of prosperity, wellbeing and quality of life. It provides a framework for landscape adaptation and investment that can tackle climate change, support improvements in people’s quality of life and underpin economic growth. 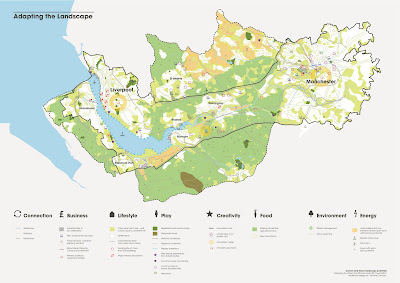 The framework we've come up with identifies the contribution that natural landscape resources can make to the future development of the Lower Mersey Basin, the area covered by this study. At the same time the approach provides a toolkit for identifying and prioritising investment that can be applied to any area. This is centred around a move towards a more self-sufficient, sustainable region with an emphasis on localism, renewable energy production, the growing of food and energy crops and a landscape well adapted to climate change. 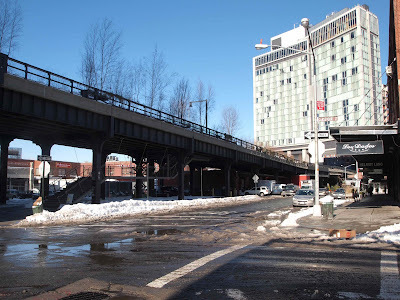 Here, the key is to connect the city regions and major towns with stronger communications set in an area of attractive and marketable green infrastructure. There would be a focus on jobs and opportunities through the connection of knowledge centres and growth industries, including environmental technologies and services. This strand recognised the importance of high quality, accessible local environments where people can play, travel and work. Waterways will become destinations and leisure routes; flood alleviation measures will be used to create new landscapes and culture and art will be used to transform the visual experience of the region. Green the cities. Take the landscape of the Lower Mersey Basin into the heart of the cities with street trees and enhanced green infrastructure. Embrace the waterfronts. Create and improve green access along the river and other waterways, stretching into the heart of the city regions and where possible, new water bodies. Create a diverse landscape. Make the Mersey Bioregion the most dynamic, productive and biodiverse landscape through land art, farms and planting. Manage a productive landscape. Produce energy from wind, tides, biomass and the sun. Facilitate an accessible landscape. Establish a fine grain network of paths and bridges to accompany existing strategic arteries with an emphasis on localism. Create a landscape for prosperity. Continue the Mersey’s history of innovation. In centres like Daresbury it is environmental technologies leading our way into a low carbon future. Build a resilient and playful landscape. Utilise funding for flood defences to respond to flood risks and create iconic cultural landmarks, public space and new biodiverse habitats as part of ‘Mersey Playgrounds’. Our next challenge is to build all of the above into the region's new Integrated Strategy (RS2010). Watch this space for more details. Guerilla Lighting in Manchester, originally uploaded by shrinkingworld. 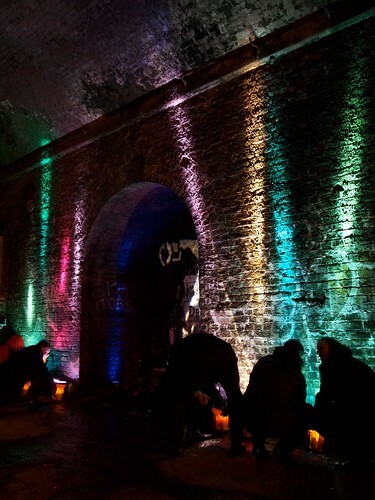 Photos of a guerilla lighting 'action' led by BDP in Manchester during December 2009. The photo is of an illuminated railway arch just near the old UMIST campus. More photos at Martin Lupton's dedicated Guerilla Lighting blog. There also more images at Walter Menzies' blog.